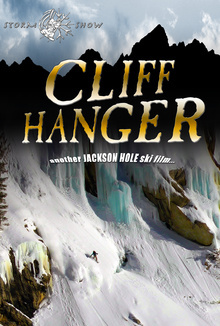 Jackson Hole, Wyoming's homegrown movie-house, Storm Show Studios celebrates their 15th anniversary ski/ride/adrenaline film with "Cliff Hanger"! Jackson Hole, Wyoming's homegrown movie-house, Storm Show Studios celebrates their 15th anniversary ski/ride/adrenaline film with "Cliff Hanger"! Destined to become another classic Jackson Hole ski film from veteran producers Darrell Miller & Ryan Halverson. Featuring your favorite Storm Show stuntmen & women including Derek Depiero, Rajat Bhayani, Jason Elms, Rob Kingwill, Dave Van Ham, Halina Boyd, Kelly Halpin, Daniel Tisi, and many other ripping shredders. Highlights include harrowing first ski descents in the Jackson Hole backcountry, major peaks of the Teton Range, neck-deep powder in Hakuba, Japan, and Wind River's Gannet Peak, the highest peak in Wyoming! Get your ski-flick fix for the impending winter season with Storm Show/FRP’s “Cliff Hanger”!